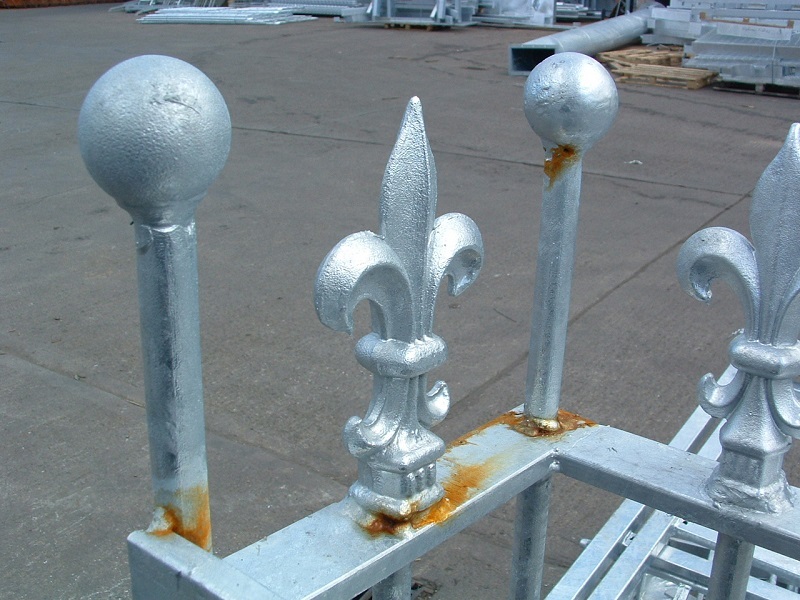 Galvanized steelwork can be subject to staining and discolouration which can sometimes be mistaken for failure of the coating and rusting of the base steel. There are numerous reasons why such staining may take place and there are summaries below. One of the most common causes of discolouration is general surface contamination with dirt and debris. Such discolouration is easily removed by mild abrasion with wire brush to reveal a sound galvanized coating. Staining and discolouration sometimes takes place at or adjacent to welds as a result of weld seepage (see image below). This occurs as a result of pre-treatment solutions used to clean the steel prior to hot dip galvanizing becoming trapped in weld pin holes. 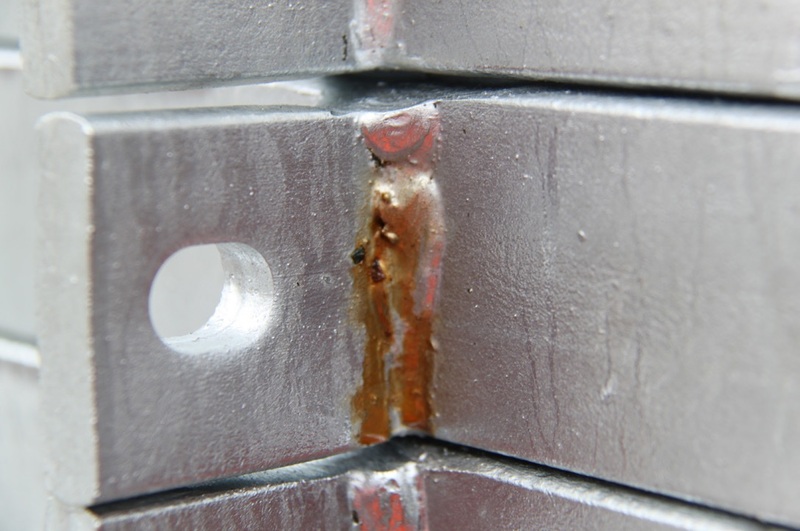 The heat of the galvanizing process drives off any moisture leaving behind a residue in the pin holes. However, when externally exposed, moisture is drawn into the pin holes by capillary action and the residue dissolves and then seeps out to give a reddish/brown discolouration. Such staining may be removed by wire brushing and provided all the residue has seeped out, staining should not reoccur. Where an article for galvanizing contains over lapping areas which are stitch welded together pre-treatment solution may become trapped between the overlapping surfaces. Moisture is driven off during the galvanizing process leaving a residue which may subsequently dissolve in moisture drawn in between the overlapping surfaces by capillary action. Such moisture may then seep out giving a reddish/brown stain similar to that for weld seepage. Such staining may be removed by wire brushing and provided all the residue has seeped out, staining should not reoccur. When steelwork is being cut near to galvanized steelwork, hot swarf particles may disperse and become embedded on the galvanized coating. The swarf may then rust giving the appearance of the galvanized coating having failed locally. The staining can then be removed by mild abrasion or cleaning with commercial grade oxalic acid. Galvanized steelwork may be stacked using timbers to act as spacers between work so as to prevent metal-to-metal contact which might lead to scraping or damage to the coating. If the timber becomes wet, then chemicals may leach out of the timber and deposit on the galvanized coating giving a brownish discolouration. Such staining may be easily removed by wire brushing to reveal a sound galvanized coating beneath. 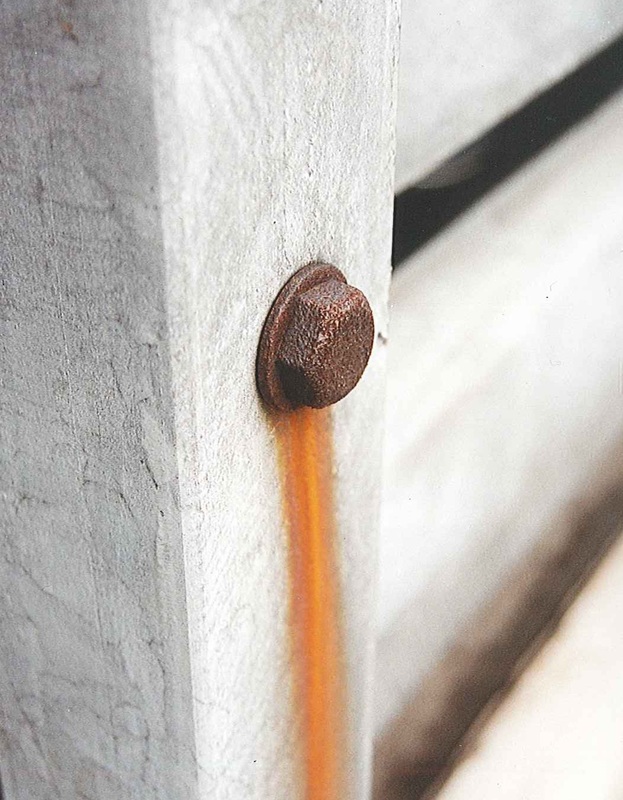 If galvanized steelwork is subject to mechanical damage, or it is welded with inadequate repair being conducted, then the exposed area may corrode leading to staining and discolouration of the surrounding sound galvanized coating. Rust staining maybe removed by mild abrasion or cleaning with commercial grade oxalic acid, the latter process requiring subsequent washing down with fresh water. It is essential though that any exposed surfaces are repaired so as to prevent possible future corrosion and staining.